Learn the latest Inside Secrets From Dr. Mark Rosenberg, as he Reveals The Most Powerful Methods Ever to Help your Cancer Patients and build an profitable outstanding practice while doing so..
You’re surrounded by some of the smartest people in the practice, you have access to all the videos, research, calls, checklists, and people that have most of the answers you need. You are taking luxury travel trips and masterminding with like-minded people to some exotic places on earth while your office team is being trained for you on how to market your practice effectively and build a great practice. You have periodic calls directly with Dr. Rosenberg to discuss any questions you have or review patient questions you have. You have metrics and clear plans for the future of your practice. You’re on monthly webinars with the industry experts keeping you fully up to date on the latest research and results. You and your team come to live events with Dr. Rosenberg and his team of business building experts. Imagine that… And that is just the tip of the iceberg. What would that mean for your practice, your patients and your own quality of life and income? It is certainly life changing for you and the people around you. What’s that worth? Well… just one weekend with Dr. Rosenberg in his private preceptorship is $17,000 and it does not even cove most of above. Why This Program is Essential to Your Practice and Your Future? Gain actionable insights into the science behind the methods and techniques that Dr. Mark Rosenberg, his team and his colleagues are using now to see improvements in the quality and quantity of life of their patients. Discover the science behind why the technique works to reduce the effects and proliferation of cancer. Take a deep look into the tests implemented by Dr. Rosenberg, his team and his research partners, and the results they saw. Along with how you can implement each treatment or regimen in your practice immediately, and expect the same results. Receive details on future research, tests and the ongoing results as Dr. Rosenberg and his team evolve the processes involved in each area of cancer management focus, in a simple, straight-forward manner, making it easy for you to apply findings to your patients' health. As a Doctor, how to achieve the highest quality of life while healing more people. * Insight to Dr. Mark's 20+ Years of Research and Experience Priceless access to Dr. Mark's evolving path from ER Doctor to in-demand integrative cancer doctor, scientist and researcher. * Instant Access…Follow the courses in order, jump to a topic you’re working with or revisit a lesson whenever you need it. * Actionable Knowledge Over 20 lessons containing actionable insights into the science behind the methods and techniques Dr. Rosenberg and his team are now using. Includes ongoing practical application discussions. *Supplemental Materials Lessons are supplemented by reports, studies and materials to download. "Interviews with Experts" Series – Discussions with the subject experts hand-selected to talk to ACCEP members about the issues ranging from medicine, to insurance, to running a practice and marketing. 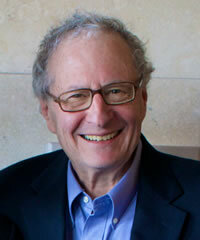 Live Calls & Webinars With Dr. Rosenberg–where he shares the latest news on cancer care, or dives deep into a topic. Get time to ask question and brainstorm on your practice. Training to Grow and Run Your Practice – Doctors need more than medical knowledge to serve their patients. Your practice needs to be profitable. ACCEP members receive information on topics to help you run your practice, market it and build a cash practice. Training your Team – Our experts will take time to train your team on everything from Nursing procedures, to front desk protocols, to marketing and planning. "Integrative Cancer Therapy Online Newsletter" - Get the latest news about upcoming events in our field, educational opportunities for you and your staff, along with breakthroughs and setbacks in Integrative Cancer Care. Messages from Dr. Mark - As Dr. Rosenberg sees advances, setbacks and surprising research arise in his day to day practice, and from his colleagues around the world, receive occasional messages to peek inside his practice. Member Exclusive Invitations - to our annual Adaptive Cancer Care Meeting for you and your staff in Boca Raton, FL. Exotic Private Travel Trips - The Opportunity to join Dr. Rosenberg and other professionals in your field on exotic vacations as we mastermind and have fun. 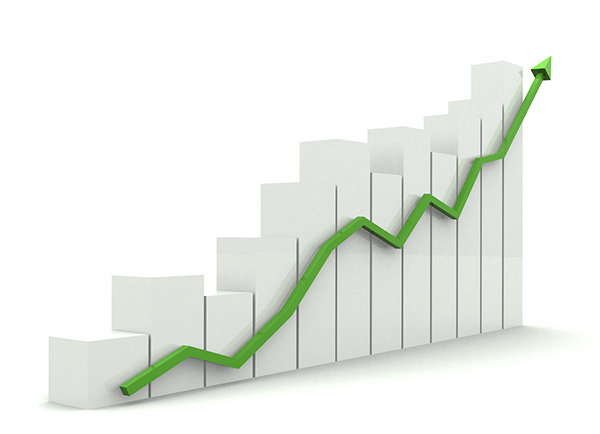 And much more – see our membership levels chart for a full listing. What makes this online program so unique is… you'll see the many different approaches, combinations, treatments and practical application that no one else is using, except for a handful of Dr. Mark's closest colleagues. Which means you'll be on the cutting-edge of Adaptive Cancer Care, with Dr. Rosenberg and his Team and colleagues, all in an online and phone-based training environment. 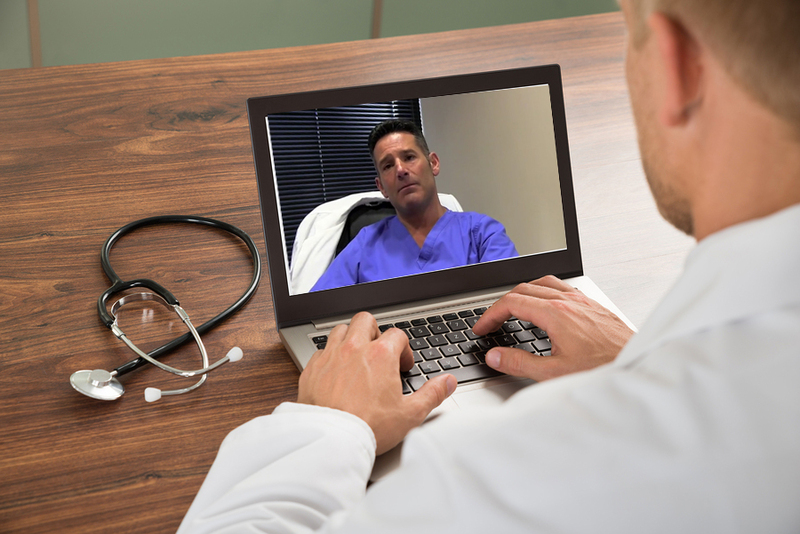 So you can use and adapt Dr. Rosenberg's secrets to your own practice and patients from the comfort of your own office, no matter where you are in the US. And YES… Dr. Rosenberg's methods are complementary with your usual standard of care regimens and procedures. 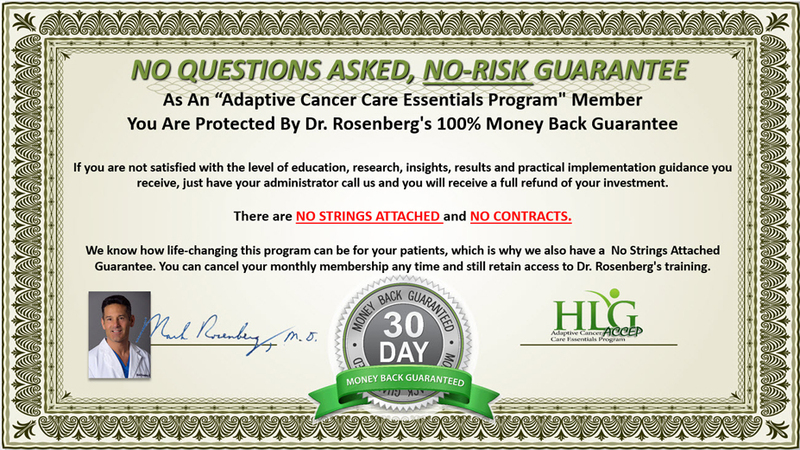 "I am honored to be able to endorse Dr. Rosenberg, as well as his program, “Adaptive Cancer Care Essentials Program.” As a board certified hematologist-oncologist, I see too many conventional oncologists who are unwilling to step outside of the box. The truth is that “the box” has not been working for the majority of patients with advanced-stage cancer. Dr. Rosenberg is a physician and a scientist who is constantly searching for novel techniques and modalities to improve cancer detection and treatment. His insight and research is cutting edge, and as his colleagues are aware, he pushes the envelope to improve care for patients who don’t benefit from the standard of care. I highly recommend Dr. Rosenberg’s program for all health care practitioners who want to deliver the best in care to their patients. 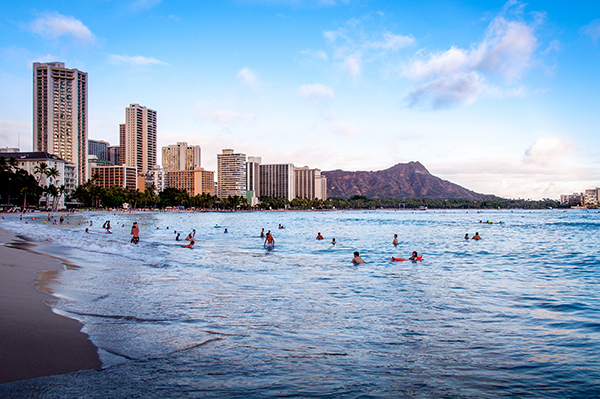 Stepping Up to the Future of Cancer Management is Easy. When You Let Dr. Mark Rosenberg Guide You Down The Path Every Month. 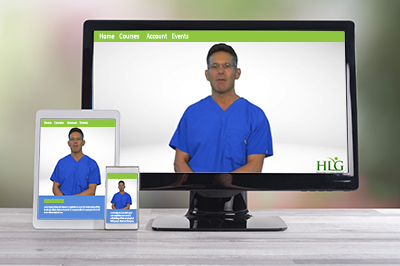 Build a More Profitable Practice With Dr. Mark Rosenberg and His Team By Your Side. Will these strategies work for me? These approaches work for all health professionals involved in cancer management, whether you're an oncologist, a clinician, a nutritionist or any other type of practitioner. Will I be outside of the standard of care and lose my license? Adaptive Cancer Care is made up of complementary methods and techniques that work along side of standard of care regimens and treatments. Your license is safe. How do I deal with the difficulties associated with what government and insurance companies are doing to medical professionals? The fact is, they are trying to make things hard so we don't get paid. Government squeezes practitioners out of 30%, while insurance is paying less. With the business strategies you'll also gain in The Online “Adaptive Cancer Care Essentials Program” ACCEP, you'll see how to deal with most government and insurance company headaches effectively. What do I do about increasing government compliance issues in my practice? Whether you have a cash practice or insurance-based practice, you now have to report into the new system and deal with confusing compliance issues. With us by your side, you'll get the help you need to stay strong in the storm of government and insurance regulations. With Dr. Mark Rosenberg by Your Side, All Online. With Our 30 Day 100% Money-Back Guarantee.